For those who have access to the February issue of QST there is an informative article about the relation of trees to antennas in close proximity to each orther. Test were performed across many ham radio bands in both the vertical and horizontal plane using NEC software. It turns out that what Rich Fry has been telling us all along is correct. 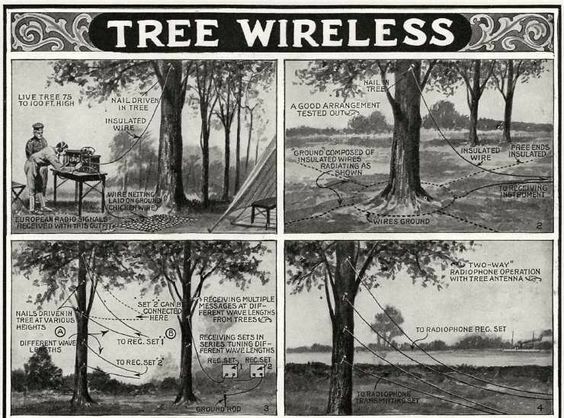 Trees have little or no effect on antennas on the 160 meter band. (1.8 to 2 MHZ) So it is safe to apply this data to the AM Broadcast Band. Depending on moisture content, trees conduct electricity. I once set a PZM (metalic) microphone on a tree stub following a recent rain and got a tingly shock. The moral of the story, if you do a live report from up a tree be sure to wear electrician’s insulated gloves. There may be something here for home owner agreement and apartment radio stations with access to a nearby tree. And the indoor operations might try a potted plant with baseboard radial wires. A HAM might get in trouble if he tries 1,500 Watts into a potted plant. Experience at radio8z transmitter site shows that if bushes or tree branches touch the radiating conductor then it is knocked off resonance by a bit. Quandry: do I trim the bushes or trim the antenna? I have a friend in South Florida that trims the trees at the far end of his dipole by running 1500 watts. A neighbor called him and told him that his tree was on fire. True story. Here at Worldround Radio we are planning a few outdoor antennas and after reading this thread we’re going to think tree. In fact today we plan to tour the back of the campus where numerous trees enjoy safe habitat. The objective will be to select one or more trees for incorporation into our antenna plans. There’s no need to paint the trees red and white because they’re under 200′. Maybe the transmitter could be in a tree house. We could either hire a tower crew or a tree service. That weed reception sparks (no pun intended) plenty of ideas. We could manufacture the world’s first all weed radio! The ALPB could open a weed research lab! In other radio activity, I took a sunny tour of the campus out back and see all kind of opportunities to connect antennas into trees.